A rocky hill with a view, Bernal Heights Park features a community garden and is popular with dog owners! To find out about plot availability, or to sign up for an available garden plot, please visit the Recreation and Parks Department Community Garden website. Bernal Heights Park is owned by the San Francisco Recreation and Parks Department. They join at the intersection of Octavia and Fell as a green memorial to the city's newest park and the last act of the Freeway Revolt. Act One began in 1956 when the San Francisco Chronicle published a map of city freeways planned by the state highway division. The network ran through the Sunset, across the Marina, through Fisherman's Wharf, the Panhandle and Golden Gate Park. Over 30,000 outraged residents gathered in neighborhood meetings and signed petitions in protest. In 1959 the Freeway Revolt scored its first victory when the Board of Supervisors cancelled seven of the ten routes. And that year, the first leg of the Central Freeway opened. In 1964 the Panhandle-Park freeway was killed and in 1989, Loma Prieta earthquake damage to the widely unpopular Embarcadero Freeway justified the city in tearing it down. Sections of the Central, also damaged, were razed in 1992, and in 1996, demolition of its closed upper deck began. 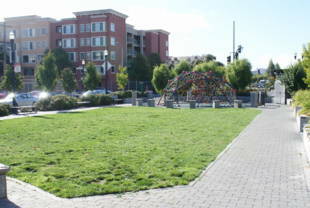 Lying between Fell and Hayes and planted in grass, Hayes Green is 275' long and 65' wide. 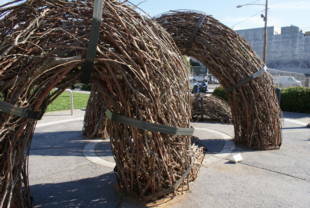 DPW landscape architect John Thomas has studded it with people-friendly amenities: wooden tables seating 2 or four people, benches scattered throughout, 14'ft acorn bulb lights, a dome play structure. Covered in a network of ropes, it invites kids to climb both outside and inside, where the igloo-like space has hammocks to romp on. Palm trees tower at one end of the Green, mayten trees at the other. Gingkos border the lawn brightened with mixed perennial flowerbeds. A halftime gardener will be on duty for the next three years. 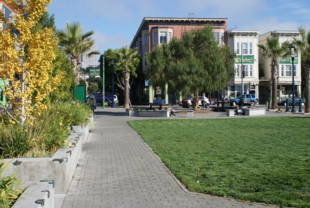 Hayes Green opened in synchrony with the 2005 United Nations World Environment Day 'Green Cities' conference, June 1-5. The Hayes Valley Neighborhood Association, Hayes Valley Business Association and Neighborhood Parks Council hosted a Mayor's breakfast for Mayor Gavin Newsom, former mayors Art Agnos, Frank Jordan, and Willie Brown, Dianne Feinstein, and delegates from around the world. On the table, along with coffee and Danish, was the discussion and development of a set of Urban Environmental Accords that would provide a roadmap for improvement of life in their cities. 'This conference is a remarkable opportunity for all of us to establish guideline for environmentally sensible urban life,' Newsom said. 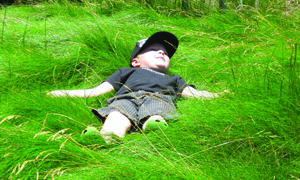 *After the death in 2006 of Patricia Walkup, the park's most devoted and tireless supporter, the community voted to change the site's name in her honor. 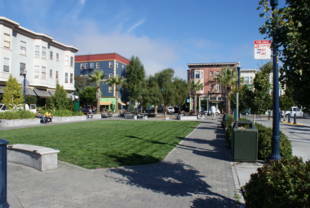 It is now known as Patricia's Green in Hayes Valley.